Status: Inactive; Active 1973-1998. Born: 1939-08-16. Spaceflights: 4 . Total time in space: 371.73 days. Birth Place: Komsomolsk-na-Amure, Khabarovsk. PERSONAL DATA: Born August 16, 1939 in the city of Komsomolsk-on-Amur in the Russian Far East. Married. Has two daughters and a son. His hobbies include tennis, angling, hunting, walking through forests, and travel. EDUCATION: In 1958, he was graduated from the Kaliningrad Mechanical Engineering Technical College with the specialty "Cold Working of Metal." In 1966, he was graduated from the Department of Electronics and Computing Technology of the Moscow Forestry Engineering Institute with the specialty "Spacecraft Control Systems." SPECIAL HONORS: Ryumin has been decorated twice as Hero of the Soviet Union, and has been awarded other Russian and foreign decorations. EXPERIENCE: From 1958 to 1961, Ryumin served in the army as a tank commander. From 1966 to the present, he has been employed at the Rocket Space Corporation Energia, holding the positions of: Ground Electrical Test Engineer, Deputy Lead Designer for Orbital Stations, Department Head, and Deputy General Designer for Testing. He helped develop and prepare all orbital stations, beginning with Salyut-1. In 1973, he joined the RSC Energia cosmonaut corps. A veteran of three space flights, Ryumin has logged a total of 362 days in space. In 1977, he spent 2 days aboard Soyuz-25, in 1979, he spent 175 days aboard Soyuz vehicles and the Salyut-6 space station, and in 1980, he spent 185 days aboard Soyuz vehicles and the Salyut-6 space station. From 1981 to 1989, Ryumin was flight director for the Salyut-7 space station and the Mir space station. Since 1992, he has been the Director of the Russian portion of the Shuttle-Mir and NASA-Mir program. In January 1998, NASA announced Ryumin's selection to the crew of STS-91. Ryumin served aboard STS-91 Discovery (June 2-12, 1998) the 9th and final Shuttle-Mir docking mission, concluding the joint U.S./Russian Phase I Program. The STS-91 mission was accomplished in 154 Earth orbits, traveling 3.8 million miles in 235 hours and 54 seconds. Born August 16, 1939 in the city of Komsomolsk-on-Amur in the Russian Far East. Married. Has two daughters and a son. His hobbies include tennis, angling, hunting, walking through forests, and travel. In 1958, he was graduated from the Kaliningrad Mechanical Engineering Technical College with the specialty "Cold Working of Metal." In 1966, he was graduated from the Department of Electronics and Computing Technology of the Moscow Forestry Engineering Institute with the specialty "Spacecraft Control Systems." Ryumin has been decorated twice as Hero of the Soviet Union, and has been awarded other Russian and foreign decorations. From 1958 to 1961, Ryumin served in the army as a tank commander. In January 1998, NASA announced Ryumin's selection to the crew of STS-91, the final scheduled Shuttle-Mir docking mission, concluding the joint U.S./Russian Phase I Program. STS-91 is scheduled for a May 1998 launch. Family: Cosmonaut. Country: Russia. Spacecraft: Salyut 6, Mir. Flights: Soyuz 25, Soyuz 29, Soyuz 32, Soyuz 35, Soyuz 37, STS-91. Agency: Korolev bureau. Bibliography: 12, 5962. 1939 August 16 - . Birth of Valeri Viktorovich Ryumin - . Nation: Russia. Related Persons: Ryumin. 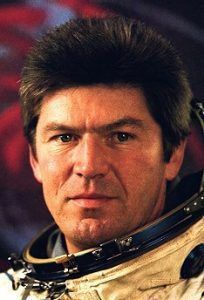 Russian engineer cosmonaut 1973-1998. Was married to astronaut Yelena Kondakova. 371 cumulative days in space. Civilian Engineer, Korolev OKB 4 spaceflights, 371.7 days in space. Flew to orbit on Soyuz 25 (1977), Soyuz 32, Soyuz 35, STS-91..
1973 March 27 - . Energia Engineer Cosmonaut Training Group 4 selected. - . Nation: Russia. Related Persons: Aksyonov, Ivanchenkov, Ryumin, Strekalov. 1977 October 9 - . 02:40 GMT - . Launch Site: Baikonur. Launch Complex: Baikonur LC1. LV Family: R-7. Launch Vehicle: Soyuz-U. Soyuz 25 - . Call Sign: Foton (Photon). Crew: Kovalyonok, Ryumin. Backup Crew: Ivanchenkov, Romanenko. Payload: Soyuz 7K-T s/n 42. Mass: 6,860 kg (15,120 lb). Nation: Russia. Agency: MOM. Program: Salyut 6. Class: Manned. Type: Manned spacecraft. Flight: Soyuz 25. Spacecraft Bus: Soyuz. Spacecraft: Soyuz 7K-T. Duration: 2.03 days. Decay Date: 1977-10-11 . USAF Sat Cat: 10401 . COSPAR: 1977-099A. Apogee: 240 km (140 mi). Perigee: 194 km (120 mi). Inclination: 51.60 deg. Period: 88.80 min. Manned two crew. Unsuccessful mission. Failed to dock with Salyut 6..
1977 October 11 - . Landing of Soyuz 25 - . Return Crew: Kovalyonok, Ryumin. Nation: Russia. Related Persons: Kovalyonok, Ryumin. Program: Salyut 6. Flight: Soyuz 25. Soyuz 25 landed at 03:24 GMT. .
1978 June 15 - . 20:16 GMT - . Launch Site: Baikonur. Launch Complex: Baikonur LC1. LV Family: R-7. Launch Vehicle: Soyuz-U. Soyuz 29 - . Call Sign: Foton (Photon). Crew: Ivanchenkov, Kovalyonok. Backup Crew: Lyakhov, Ryumin. Payload: Soyuz 7K-T s/n 46. Mass: 6,800 kg (14,900 lb). Nation: Russia. Agency: MOM. Program: Salyut 6. Class: Manned. Type: Manned spacecraft. Flight: Soyuz 29. Spacecraft Bus: Soyuz. Spacecraft: Soyuz 7K-T. Duration: 79.64 days. Decay Date: 1978-09-03 . USAF Sat Cat: 10952 . COSPAR: 1978-061A. Apogee: 248 km (154 mi). Perigee: 193 km (119 mi). Inclination: 51.60 deg. Period: 88.90 min. Manned two crew. Docked with Salyut 6. Placed on board the Salyut-6 station a crew consisting of V.V. Kovalenko and A.S. Ivanchenkov to conduct scientific and technological investigations and experiments..
1979 February 25 - . 11:53 GMT - . Launch Site: Baikonur. Launch Complex: Baikonur LC31. LV Family: R-7. Launch Vehicle: Soyuz-U. Soyuz 32 - . Call Sign: Proton (Proton ). Crew: Lyakhov, Ryumin. Backup Crew: Lebedev, Popov. Payload: Soyuz 7K-T s/n 48. Mass: 6,800 kg (14,900 lb). Nation: Russia. Agency: MOM. Program: Salyut 6. Class: Manned. Type: Manned spacecraft. Flight: Soyuz 32. Spacecraft Bus: Soyuz. Spacecraft: Soyuz 7K-T. Duration: 110.18 days. Decay Date: 1979-06-13 . USAF Sat Cat: 11281 . COSPAR: 1979-018A. Apogee: 256 km (159 mi). Perigee: 193 km (119 mi). Inclination: 51.60 deg. Period: 88.90 min. Manned two crew. Docked with Salyut 6. Transported a team consisting of V A Lyakhov and V V Ryumin to the Salyut-6 space station to conduct scientific investigations and experiments and repair work. Recovered June 15, 1979 16:18 GMT. Returned unmanned..
1979 June 15 - . Landing of Soyuz 32 - . Return Crew: Lyakhov, Ryumin. Nation: Russia. Related Persons: Lyakhov, Ryumin. Program: Salyut 6. Flight: Soyuz 32. Soyuz 32 landed at 16:18 GMT. .
1979 August 15 - . 14:16 GMT - . EVA Salyut 6 EO-3-1 - . Crew: Lyakhov, Ryumin. EVA Duration: 0.0576 days. Nation: Russia. Related Persons: Lyakhov, Ryumin. Program: Salyut 6. Class: Manned. Type: Manned space station. Flight: Soyuz 32. Spacecraft Bus: Almaz. Spacecraft: Salyut 6. Jettisoned KRT-10 antenna from rear docking port..
1979 August 19 - . Landing of Soyuz 34 - . Return Crew: Lyakhov, Ryumin. Nation: Russia. Related Persons: Lyakhov, Ryumin. Program: Salyut 6. Flight: Soyuz 32. Soyuz 34 landed at 12:30 GMT with the crew of Lyakhov and Ryumin aboard..
1980 April 9 - . 13:38 GMT - . Launch Site: Baikonur. Launch Complex: Baikonur LC31. LV Family: R-7. Launch Vehicle: Soyuz-U. Soyuz 35 - . Call Sign: Dnepr (Dnieper ). Crew: Popov, Ryumin. Backup Crew: Andreyev, Zudov. Payload: Soyuz 7K-T s/n 51. Mass: 6,800 kg (14,900 lb). Nation: Russia. Agency: MOM. Program: Salyut 6. Class: Manned. Type: Manned spacecraft. Flight: Soyuz 35. Spacecraft Bus: Soyuz. Spacecraft: Soyuz 7K-T. Duration: 55.06 days. Decay Date: 1980-06-03 . USAF Sat Cat: 11753 . COSPAR: 1980-027A. Apogee: 247 km (153 mi). Perigee: 197 km (122 mi). Inclination: 51.60 deg. Period: 88.90 min. Manned two crew. Docked with Salyut 6. Carried crew comprising L I Popov and V V Ryumin to the Salyut-6 station to carry out scientific and technical research and experiments..
1980 October 11 - . Landing of Soyuz 37 - . Return Crew: Popov, Ryumin. Nation: Russia. Related Persons: Popov, Ryumin. Program: Salyut 6. Flight: Soyuz 35. Soyuz 37 landed at 09:50 GMT with the crew of Popov and Ryumin aboard..